Doug’s Shoot’n Sports Utah Concealed Carry class is taught on Tuesday nights from 6-10 PM and on Saturday mornings from 8-Noon. It is a good, credible class where the instructor not only teaches about safety, proper gun handling and operation and the laws regarding concealed carry, but then verifies the shooters are safe and competent with their guns at our indoor shooting range. The actual shooting gives the class credibility. For this class you will need a handgun and ammo. Please call to schedule your carry class today. Doug’s First Steps classes are held Thursday evenings from 6-10 PM. 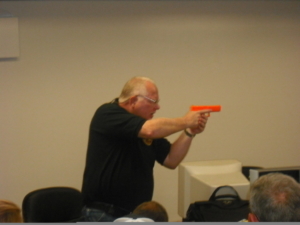 The class teaches the fundamentals of gun safety and marksmanship. It is a great beginner class but experienced shooters will learn something also. Many couples take this class together. After a discussion about firearm safety and function, the instructor discusses the shooters grip, stance, sight picture, target acquisition and trigger pull. Students then visit the shooting range with the instructor to apply the principles taught. When you leave this class you will have the fundamental knowledge that, when combined with practice, will allow you to shoot more accurately than you ever have. 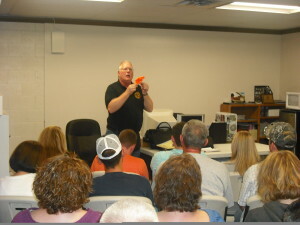 Doug’s New Shooter Orientation class is designed for individuals who are new to or inexperienced with firearms. 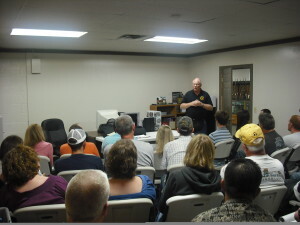 If you are looking to purchase a gun and don’t know where to start this class is for you. In this class you will learn about semi- automatics and revolvers and the differences between single, double and safe actions. You will leave with the knowledge you need to pick the right gun to meet your needs. During this class you will shoot. Firearms and ammunition will be provided. The tuition is $20. We will credit you back $10 towards your gun purchase. One of the coolest classes we offer is our kids class. Intended for children 3-10 years old, it is based upon the NRA Eddie Eagle program and teaches the kids to Stop, Don’t Touch, Leave the Area and Tell an Adult. It is not a shooting class. It is a safety class. We like to have 8 or more kids in each of these classes to make them exciting. Best of all, the class is FREE. We want to do our part to promote gun safety with children. These classes are usually on Saturday afternoon but can be scheduled anytime. 2016 © Copyright Doug's Shoot N' Sports. All Rights Reserved.